At some time or another most people would like to visit an artist’s studio, if nothing else to see how another profession works. This is understandable since a lot of jobs are seen as routine and boring. But with Art, (break out the soft lyrical music, the soft-focus lens, and the dreamy voiced narrator) it’s different – or at least the vast majority of people think so. Even my brother thinks that. .Full-time artists for the most part have a full-time dedicated space that they work in. It is easier for them not to set up and break down their studio day after day. The setup/break down routine is a disruption to the process of getting started and proceeding with the work for the day. With a full-time studio, comes a certain form of organization for the artist. This style of organization usually does not work well for the visiting patron who is used to seeing a completely hygienic selling space. The typical client – that we usually see – is one that has an aversion to mess, clutter, and loose organization. To see a client requires the artist to make the studio presentable, so that the organization of the studio is not a distraction. I am not talking about day-in day-out maintenance of sweeping the floors, vacuuming, washing brushes etc. that is taken for granted. Putting away all the normally used tools of the trade, arranging the artwork on the walls and pedestals tastefully, putting out fresh flowers, leaving some art magazines that mention you carelessly left open to that page, etc. Is the name of the game. As an artist, the job is to make it easy for the client to buy, by making it appear that you work effortlessly. That is why it is important to call for an appointment. The client does not want to be embarrassed to see the artist in their less than immaculate studio. The artist does not want to be embarrassed by the clutter and what the client infers from the mess of the studio. Let’s not talk about the mess on the artist from working at their medium. Without an appointment this is a lose/lose situation. There is also the case of an artist(s) having a gallery space on their property, like we do. Aha, this is the answer to the problem you think. Alas no. To properly take care of a gallery requires a person there staffing it full time. Yes the artist could do their art to some degree, but not with a full concentration. Also this opens the artist up to client questions like: “Oh – do you give lessons? That looks easy! Do you get paid for that? Why do you paint/carve like that – that’s wrong!” the artist’s time gets taken up while other clients are slipping out the door. As the saying goes Been There-Done That. One solution that we also have tried is to have me greet all the customers who come up and accompany them into the door. Looking at it from the customer’s angle is instructive though. 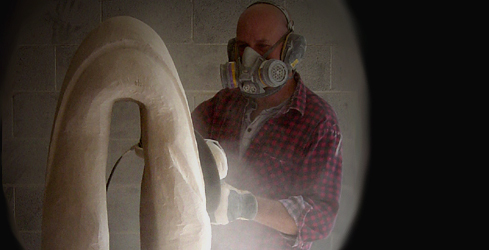 Since I sculpt with power and pneumatic tools I am usually covered with a fine coating of dust that leaves a cloud behind me as I walk. Think of PigPen in the Charlie Brown comic strip Peanuts. client’s overwhelming urge to leave colors their entire visit and subsequent encounters. Now envision the same couple but met by someone who is cleanly dressed, and not overwhelmed with dirt. Naturally the whole encounter will be better, some art can be purchased safely, and the couple are not feeling threatened. See what a difference an appointment can make?